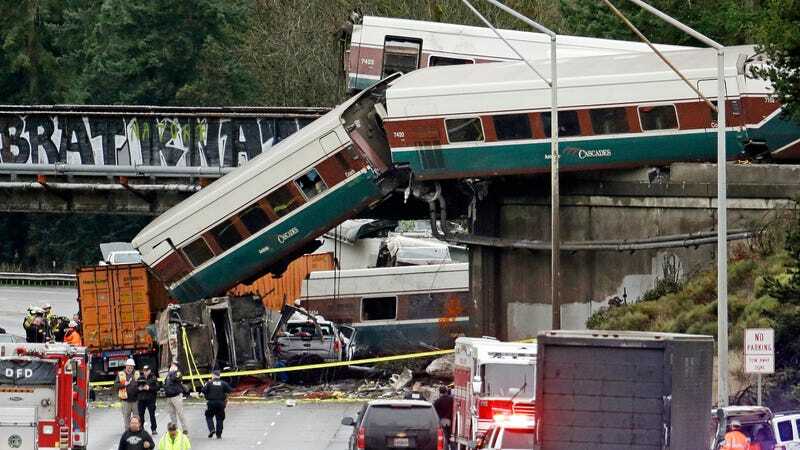 The National Transportation Safety Board interviewed the engineer and a conductor last week involved in the Amtrak train derailed in Dupont, Washington on December 18. Both had just recently recovered from injuries sustained in the crash, which killed three and injured dozens of others. On Thursday, the NTSB revealed part of what the Amtrak employees said, but the statements prompt more questions than answers about the wreck. He said that as soon as he saw the 30 mph sign at the start of the curve, he applied brakes. Seconds later, the train derailed as it entered the curve. So, to recap, the engineer had been on three practice runs along that portion of the track before, and yet still managed to miss the mile 18 milepost, shortly after which he should’ve started braking ahead of the curve. The train was on its inaugural run over the Point Defiance Bypass, a $149 million expansion of rail service from Tacoma to DuPont. Judging by the latest release, investigators seem to be probing whether having a qualifying conductor in the locomotive was enough to distract the engineer, though the conductor himself said they didn’t talk much and he spent most of the ride looking over paperwork. Investigators say their work may not be done for another year or two. Criminal charges were filed against the engineer in a similar crash in Philadelphia in 2015 after investigators determined that the engineer lost track of where he was and accelerated when he should’ve braked, though those charges were later dismissed by a judge, who ruled the crash an accident. That case is still pending.